You probably know whether the tap water in your area is naturally hard or soft by certain tell-tale signs: in a soft-water area, soap typically lathers well, while in a hard-water region, you will notice that your kettle and shower-head need regular descaling. As with the pH, the degree of hardness in the water has a much greater impact on fish than it does on us, and you need to provide your collection with appropriate conditions. Different fish species have differing needs in terms of water quality. Most tropical aquarium fish thrive in soft water surroundings, such as species from the Amazon basin, where the rivers are fed directly by rainfall. Some fish require hard water, however, such as the Rift Valley cichlids. The water in the lakes of the Rift Valley, as elsewhere, reflects the underlying chemistry of the rocks in which they formed. 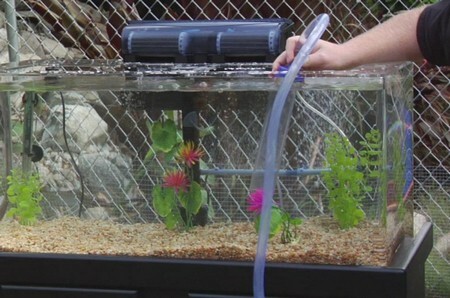 Obviously, you will not be able to alter the relative hardness of your water supply at source, but you may need to adjust it to meet the requirements of your fish. The relative hardness of water reflects the amount of dissolved salts present in it. Rainwater falling from the clouds is soft – and pure, in the sense that it has not been in contact with rock. If water filters down over limestone, however, then it acquires ions which dissolve in it, making it harder. In general, the nearer the water is to its natural source, the softer it should be, although water that has travelled over impervious rock, such as granite, may remain relatively soft. There are two sub-divisions of general or total hardness, often abbreviated to GH. One part is temporary hardness, which can be removed by simply boiling the water. It results from calcium and magnesium bicarbonate, responsible for those whitish ‘fur’ deposits in kettles in hard-water areas. The remaining part -permanent hardness – is primarily from calcium sulphate; it cannot be removed by boiling the water. For the aquarium,the temporary fraction is of most significance, since the bicarbonates serve as a buffer and so help to maintain the pH as explained previously. Unfortunately, there is no single universal scale used to measure hardness, and this can give rise to confusion. The simplest system is that which uses the number of milligrammes of calcium carbonate in a litre of water. In order to convert to the °DH scale, this figure has to be multiplied by 17.9. There are test kits available so you can check your tap water quite easily, to gain an accurate indication of its relative hardness, and you can measure both temporary and permanent hardness separately. One simple way of softening the water is to dilute the required volume of hard water with a safe source of soft water. Unfortunately, rainwater – once the obvious natural choice – is no longer reliably safe since it may contain pollutants, which could harm the fish. Distilled water, often stocked in grocery stores, is a better option. Relative hardness (mg/litre of calcium carbonate) = (volume in litres x hardness of hard water) + (volume in litres x hardness of soft water), divided by the total volume of water. Another common means of softening water for an aquarium is to use an ion exchange resin produced for this purpose. As its name suggests, this swaps ions, effectively reducing the level of calcium (which makes water hard). Make sure it substitutes hydrogen ions for calcium; many ion exchange systems utilize sodium rather than hydrogen for this purpose, which leads to an undesirable and dramatic increase in the pH. The resin will become saturated after a while, and should be treated to reactivate it. Run off and discard the first initial output from the ion exchange resin in all cases, because it may contain toxic chemicals in the form of amines. Using an ion exchange resin results in the presence of carbonic acid and carbon dioxide. The former reduces the pH in the aquarium, but effective aeration removes the excess carbon dioxide quite rapidly. More significant are the trace elements, which are needed in small amounts for the fish’s health. This is why pure distilled water or rainwater alone is not ideal; it should be mixed with ordinary tap water, which contains trace elements. A system called reverse osmosis is sometimes used, which is certainly effective but also costly. Other methods work less well, but simply adding peat to a canister filter serves to soften the water to some degree, by absorbing the calcium molecules. 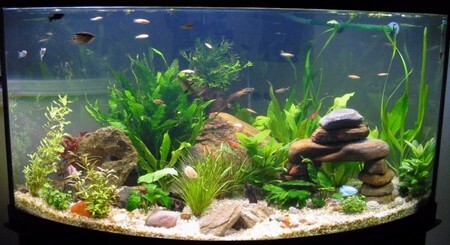 Certain aquarium plants can also affect the water chemistry, by making use of the dissolved calcium for their growth. Unfortunately, the effects are not entirely dependable. The lesser duckweed (Lemna minor), which grows well in a tropical aquarium on the water surface, is one of the most effective plants for this purpose. You may need to curtail its growth periodically, because it can mask the entire surface of the water if its spread is not kept in check by the fish. Other coldwater duckweeds have a similar effect on water chemistry, but they will not thrive in such a heated environment.